HTTPS Problems With This Blog — and Other WordPress.com Blogs | Sci-Ence! Justice Leak! As you may be aware, this blog is hosted on wordpress.com — its actual hostname is olsenbloom.wordpress.com — but I have the domain andrewhickey.info mapped to it. This has worked well for me for the last six years, but I may have to change. This is because wordpress.com have an SSL certificate for the wordpress.com domain name, but don’t have them for the domains that are mapped — and they don’t support using them if you own your own domain. This is quite annoying, as it means that sites that use wordpress’ free hosting are fine, but those of us who pay (and I pay WordPress for domain mapping, extra storage space, ad removal, and other bits and pieces — I’m a paying customer, not someone whining about a free service) have our sites broken if people are trying to be secure by using addins like HTTPS Everywhere. They don’t support that even if you’re John Scalzi, who says in this post that he uses WordPress.com VIP. If you use WordPress’ hosting, as he does, that costs *FROM* $5000 *PER MONTH*. Yet try to connect to https://whatever.scalzi.com and you’ll get exactly the same error. The $5000-per-month site is broken, while the $0 ever sites are fine. If you wish to avoid the error message when you visit sites hosted on WordPress.com, you can replace https:// in your address bar with http://. If you have any visitors who are concerned with the error when they arrive at your site, they can use the same solution. Which is helpful, especially since if visitors can’t get to the site, there’s no way to tell them how to get to the site. I’m going to get in touch with their support team on Monday (their whole support team is off work this week, for some reason) and see if they’re planning to change their — frankly bizarre — current policy any time soon. If not, I’ll probably have to move the site to somewhere else, and quickly — I pay for another year of their services on December 26. You’re not on my mailing list, which has had only two posts so far this year. “Unsubscribe to no longer receive posts from Sci-Ence! Justice Leak!. with “Unsubscribe” and “Manage Subscriptions” both clickable links. Click either of those and you’ll be able to unsubscribe yourself. Could you transfer the DNS to CloudFlare? 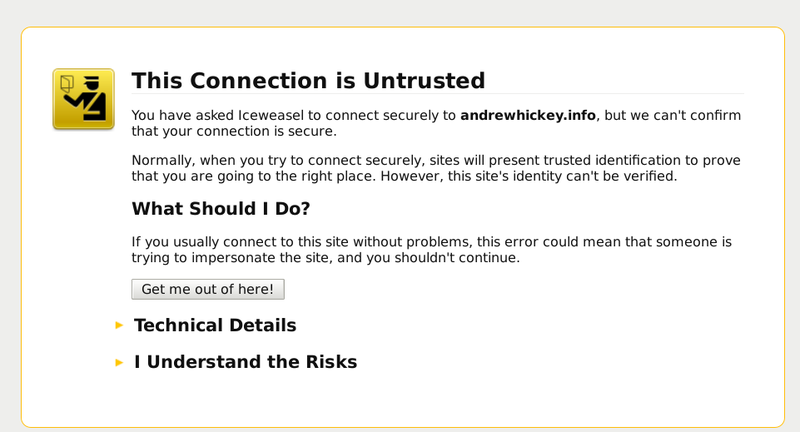 They provide free SSL certs and handle the bit between the iffy cert on the server and their proxies. I have a couple of self signed sites, with them in front and the end user doesn’t get any errors/warnings. Might be a possibility, but I don’t know if WordPress.com would support that. I’ll look into it, though — thanks for the suggestion. Please do follow up with whatever you end up doing. I run http://svpow.com/ on WordPress, too — I’m only a paying customer for the domain-mapping — and always assumed HTTPS Just Worked, as it clearly ought to in 2014. I was a bit shocked when I tried it just now and found that it didn’t. Really not acceptable any more: it’s like manufacturing a car without seatbelts. What’s the advantage to using https if you’re not communicating any private data? If you move to shared hosting you’ll probably run into the same problem, except that you can fix it by paying extra for your own SSL certificate. Traditionally, web hosts have treated secure connections as an expensive optional extra, and this is likely to cause lots of problems with a move towards making everyone use https for everything. The advantage is for people who want to browse without a third party seeing what pages they’re looking at. They’d still be able to tell what domain you were looking at, but not whether you were, say, looking at the NHS pages about migraines or about an STD. Personally, I don’t really care much about it, but there is a concerted effort by a lot of organisations to make HTTPS the default, and it seems to be pretty much a done deal.